What do you usually have for your breakfast. In Singapore most of us love to have Coffee with toast and soft boiled egg either at home, coffee shop or etc. And the most common hang out will be either at Ya Kun or Toast Box where they serve pretty good toast with soft boiled egg. 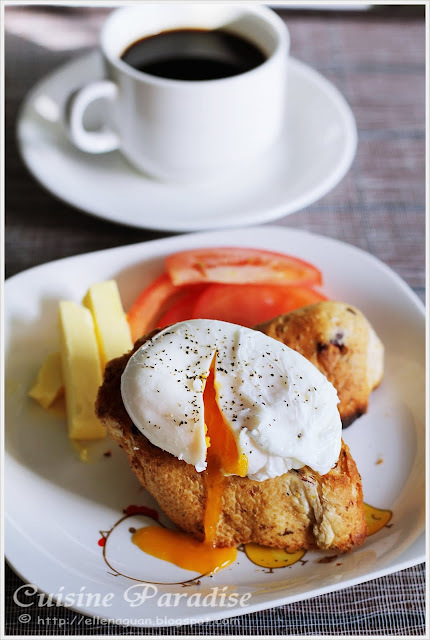 Here I will be sharing two quick and easy recipes on how to prepare Toast with Eggs like those western style breakfast serving in most cafe where you can impress your family members during weekend breakfast. 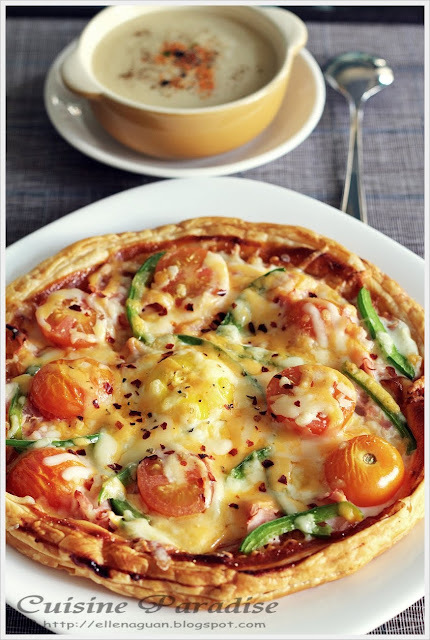 Most of us know that Eggs have excellent nutritional value. They contain protein which is needed for building and repairing the cells in muscles and other body tissues as well as supply valuable minerals and vitamins. Since my boy loves egg(he eats at least 1 egg per day) we usually have at least a tray at home every week. Recently I got a box of this new CP Chilled Fresh Eggs which are known to be sanitised, oiled and chilled within one hour of being laid to ensure that the supreme freshness from the farms is sealed and kept within the eggs. 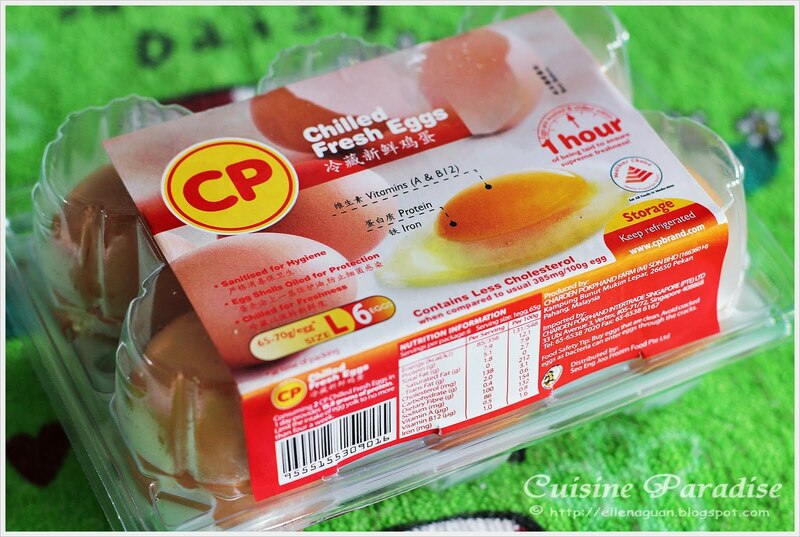 These eggs are packed in a transparent tray with size range from 65 - 70g per egg that cost S$2.50 per box of 6 Large Eggs. And on the packaging it is also stated that these eggs contain lesser cholesterol than ordinary eggs, and have a lifespan of up to 90 days! As you can see from the photos below, the egg yolk of these CP Chilled Fresh Eggs is rather more firm and orange in colour compared to the normal yellow yolks that we used to see. 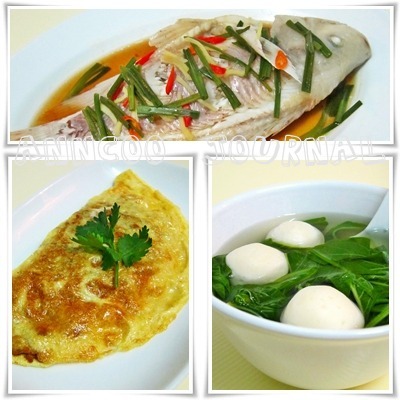 And we also find that it taste more fragrant while eating poached or soft-boiled too. If you are interested to give it a try, these eggs are available at all Cold Storage, NTUC Finest, Meidiya and Carrefour currently. 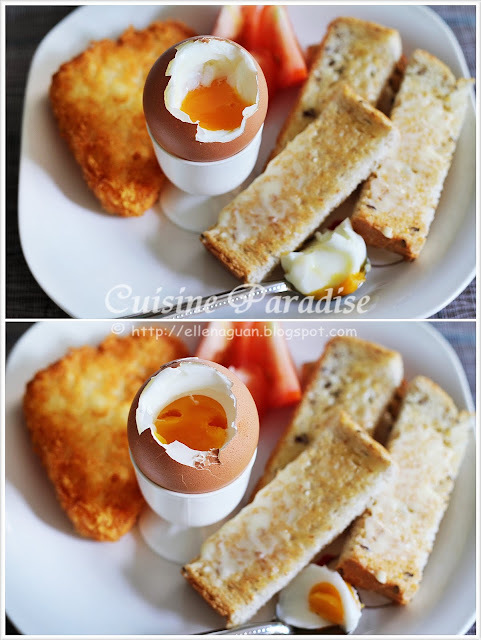 You can achieve different texture of soft-boiled egg according to your preference by timing the simmering time such as 5 minutes for medium-boiled and 7 minutes for hard-boiled (mine was about 3 1/2 to 4 minutes as I prefer it to be a bit runny for dipping my toast). 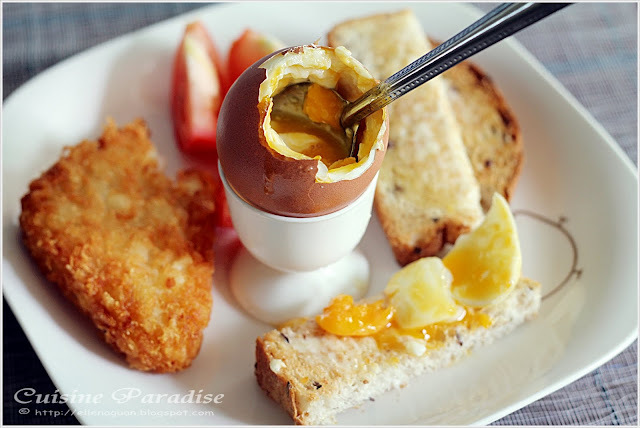 The reason for stirring egg occasionally also helps the yolk to stay centered in the egg for even distribution. 1. Place eggs in a medium saucepan. Cover with cold water and bring to boil over high heat, stirring occasionally. 2. Reduce heat to medium(once the water boil) and simmer for 3 minutes. 3. 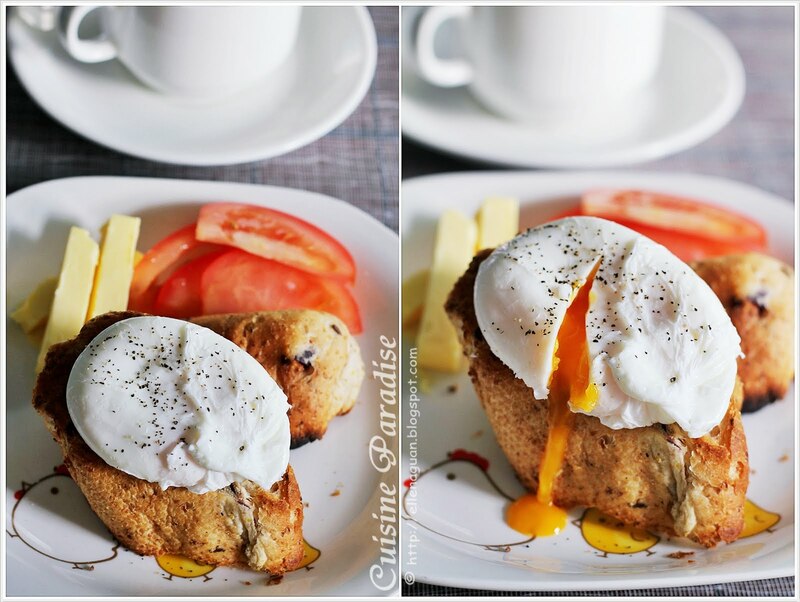 Remove pan from heat, using slotted spoon transfer eggs to egg cups. 4. 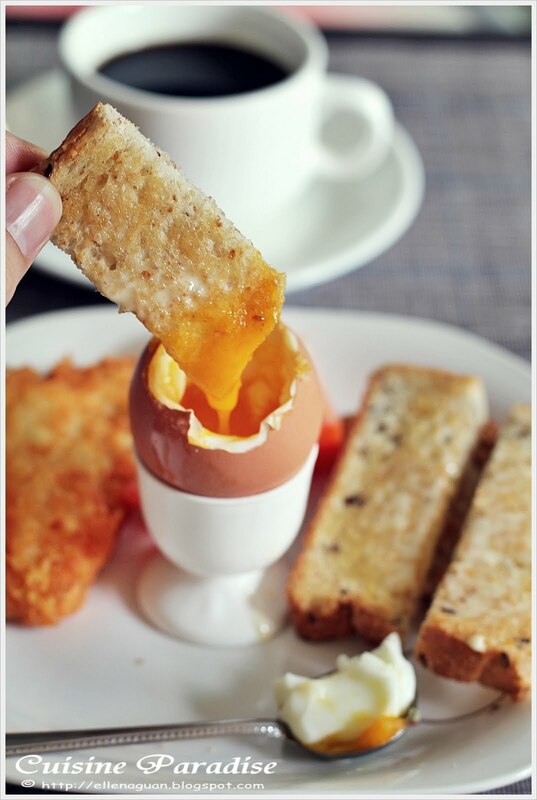 Using a teaspoon, carefully remove tops from eggs and serve with toast fingers and extra sides(optional). 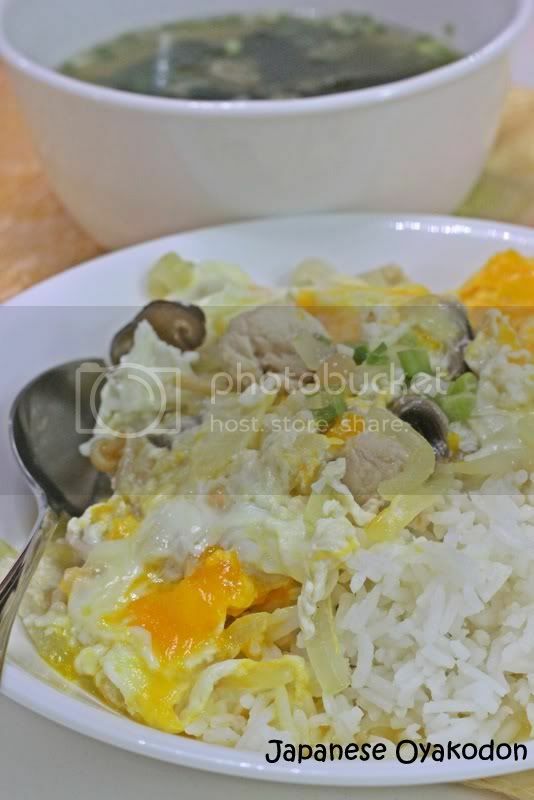 In Poaching method, the egg is cracked into a bowl then gently slid into a pan of simmering water and cooked until the egg white has almost solidified but the yolk still remains soft. And this is a healthy way of consuming fresh egg without using at oil or fat in it's preparation. 1. Pour cold water into a large saucepan at least 8 - 10cm deep. Add in white vinegar and bring to boil over medium heat. 2. Reduce heat to low(water should still be simmering around the edge with tiny bubbles). 4. 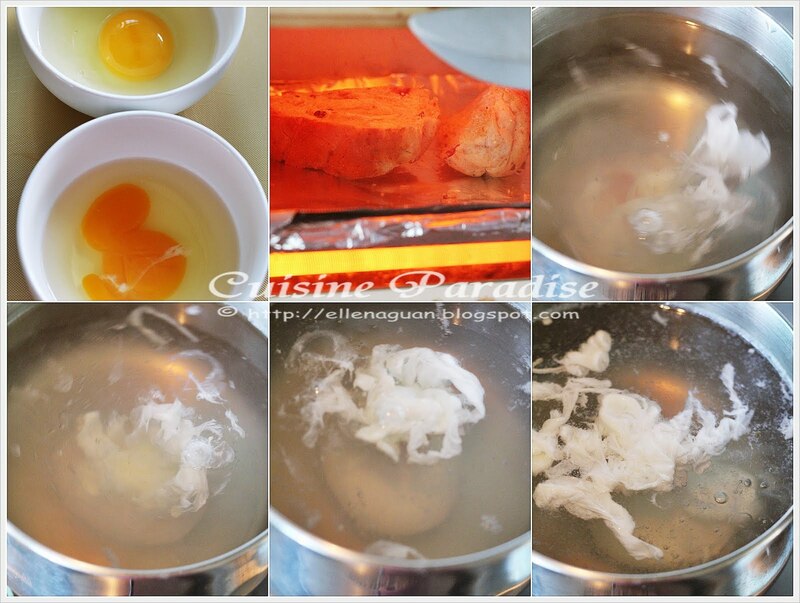 Slowly tip egg into water while with the whirlpool spinning and for 2 minutes for soft yolk or 3 minutes for firm. 5. Using a slotted spoon, remove egg from water, drained well and serve it on toast. 6. Skim foam from water and poach remaining egg. For this recipe, try to use fresh egg for poaching as the egg white will be at its thickest and it will produce a good shape. Whereas stirring the water with spoon also keeps the egg rounded while adding vinegar to the water helps to set the egg white quickly too. 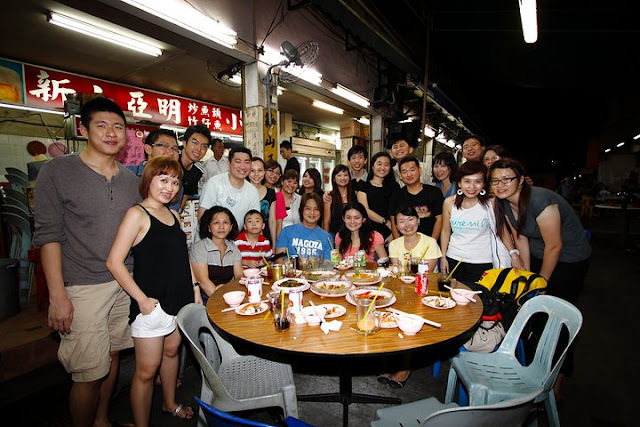 Time flies, it seems just a few days ago when we had our monthly Food Gathering at Old Airport Road Food Center (read more HERE) and yet last Saturday evening we had a enjoy gathering again for the month of April. 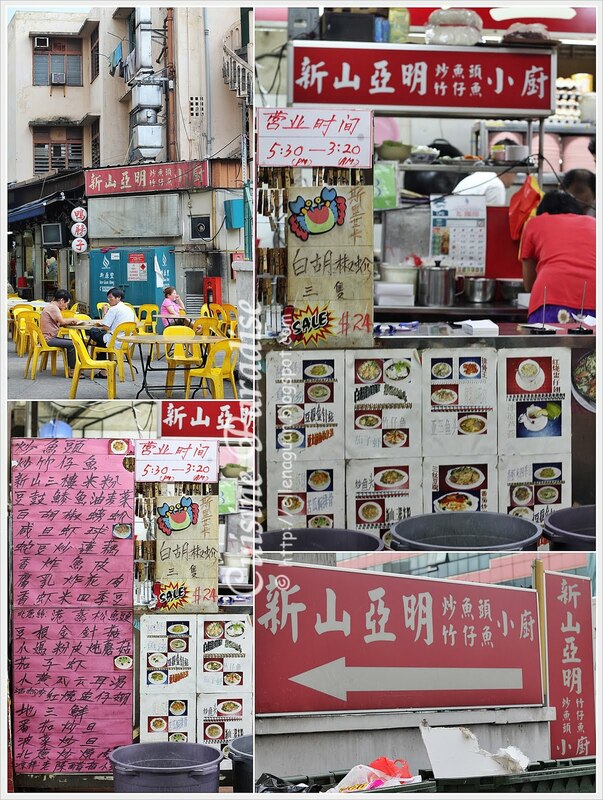 This round we set foot at a Cze Char Stall near the alley of Geylang Lorong 23. It was such a fun and exciting night where we have food, dessert and excitement seeing some Police Officers patrolling around the alleys as well as chasing a prime suspect. 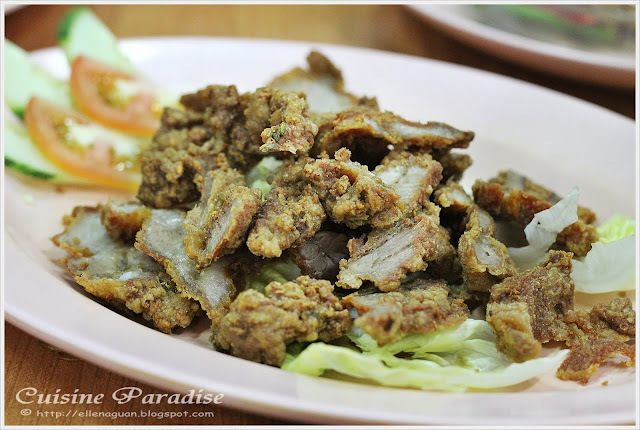 When Maureen(Miss Tam Chiak) first told me about going to “JB Ah Meng” for month gathering I was kind of shock as in I thought she was planning a food trip to Johor, Malaysia (JB). But it was till then I realize that JB Ah Meng is actually a Cze Char stall along a street at Geylang Lorong 23, Singapore. 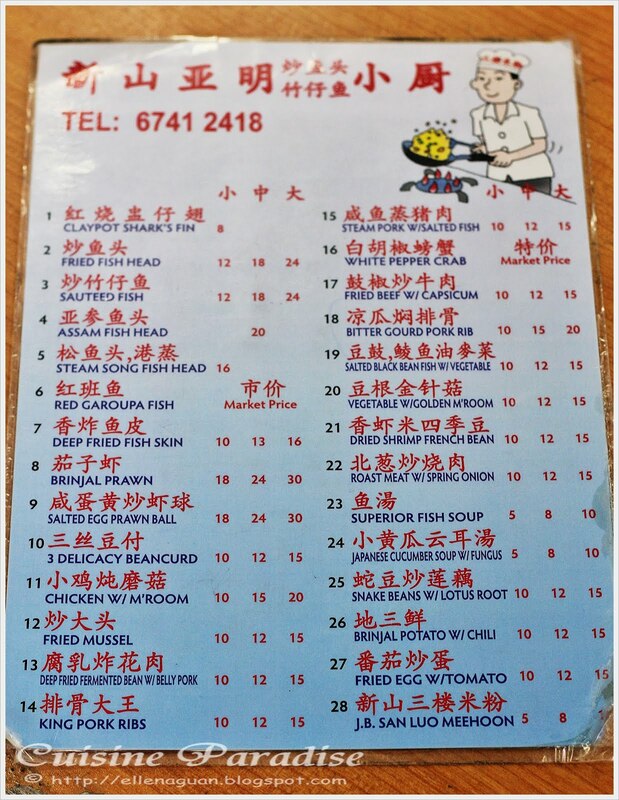 This is one of the Menu from JB Ah Meng Cze Char Stall. They also have some other in-house special dishes which are written on pink paper which pasted in front of their stall. 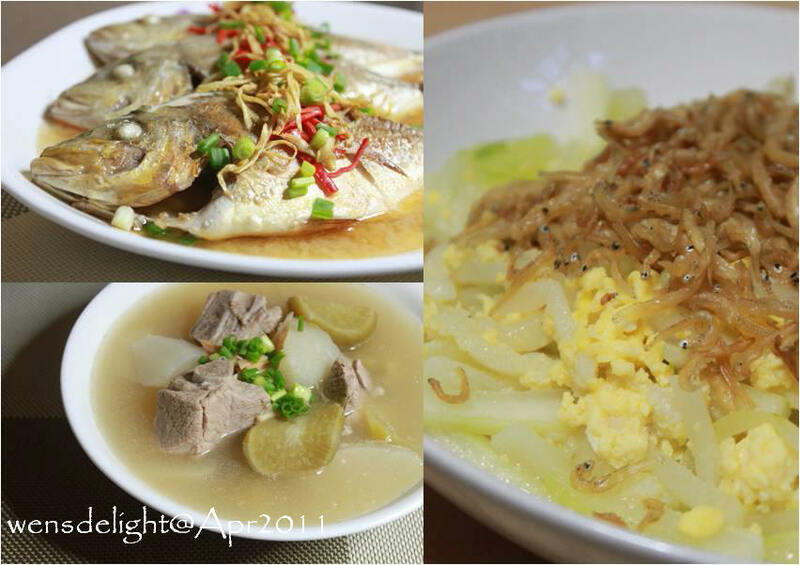 For starter we have Deep Fried Fish Skin(香炸鱼皮)with serve with Green Papaya Salad and sweet chili sauce. 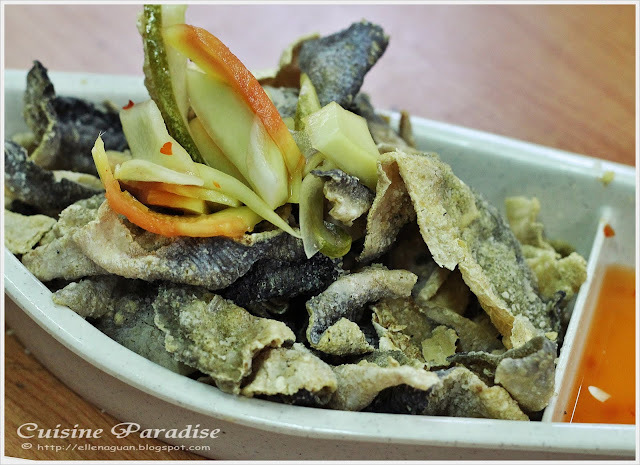 The fish skin was quite crispy and not very oil but the papaya was rather too little, hard and big pieces in size. Perhaps they could improve on the papaya salad like those julienned Thai style version. 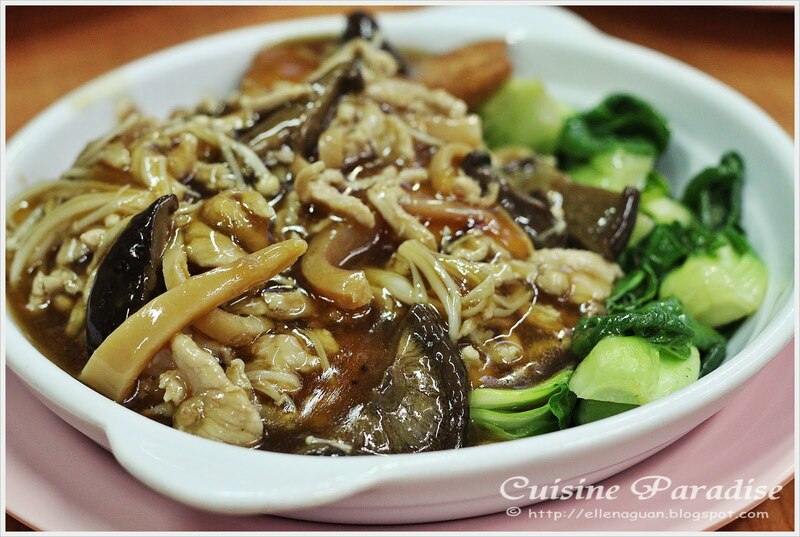 This Stewed Chicken with Liang Fen(粉皮焖鸡) comes with chicken pieces, shittake mushroom, black fungus on a bed on liang fen (mung bean noodle sheets). 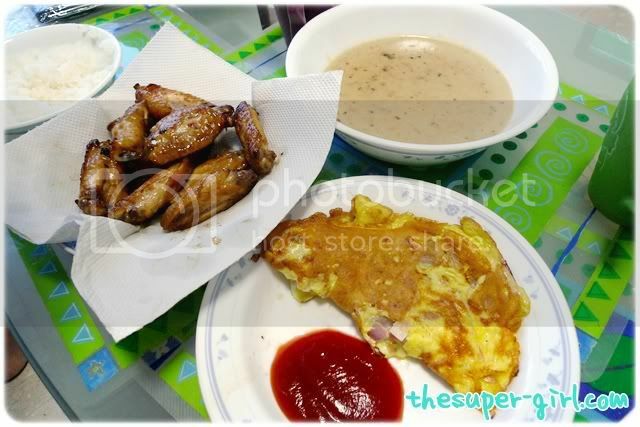 The translucent liang fen is hidden underneath the chicken pieces which appears to look like those soon kueh skin. 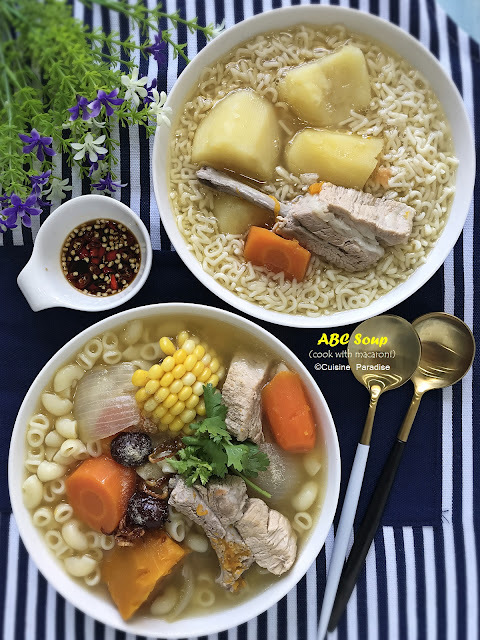 The gravy is prefect to go with steamed rice with hint of sesame oil fragrant and this is indeed a very home cooked style dish. Nothing fancy about this Fried Fish Head(炒鱼头) which is just some fried red snapper fish head pieces that stir-fried with ginger, spring onion and etc. 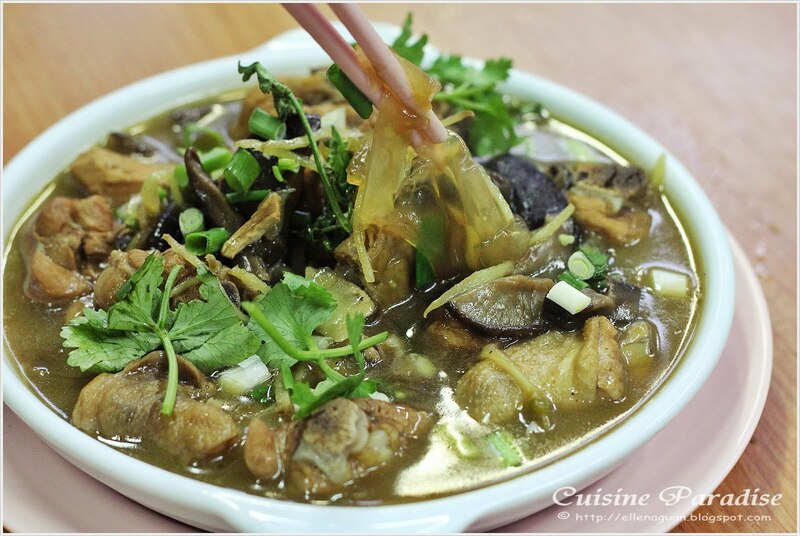 Although it has some wok fragrant but it might be too salty if it is to be eaten alone without any steamed rice. And moreover there is much "meat" pieces which makes it quite expensive for it's price. 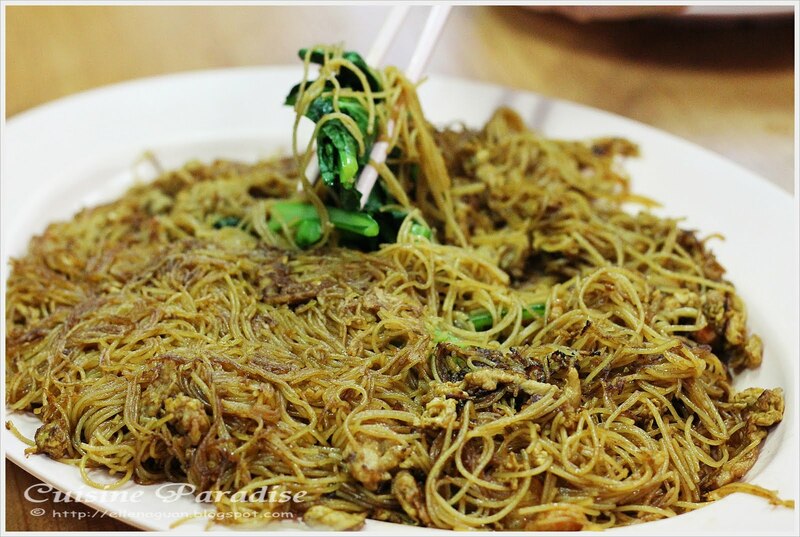 Here comes their famous pancake style fried bee hoon known as J.B San Lou Meehoon(新山三楼米粉). It has a slightly crispy top and a bed of choy sum hidden underneath the bee hoon so the best way is to give it a toss to mix it well before eating so that the choy sum will be evenly spread out. This Vegetable with Golden Mushroom(豆根金针菇) was well received at our table with it's soft and silky fried tofu that braised in the oyster sauce gravy together with cuttlefish, shittake and enoki mushrooms. 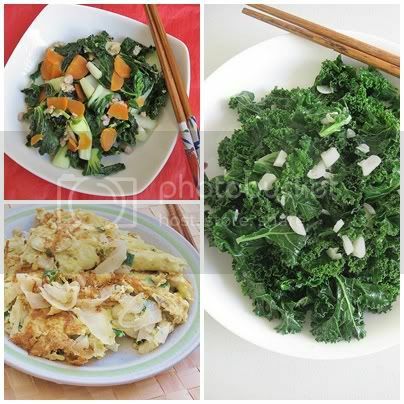 At the side there are still some generous amount of balanced baby bok choy to accompany it. 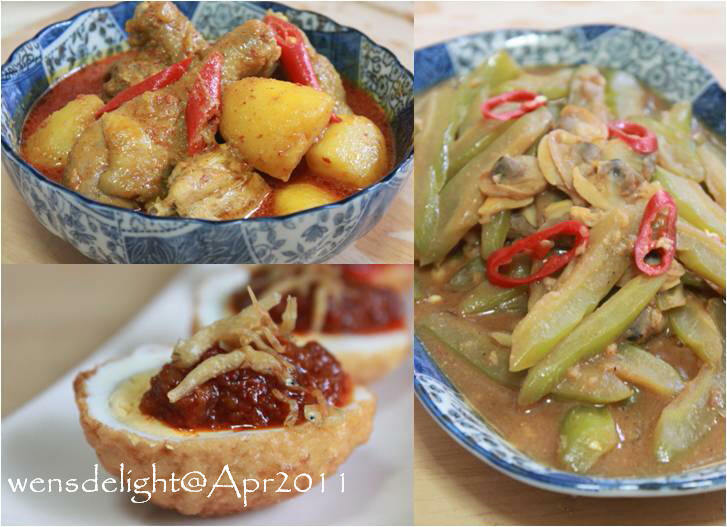 Maureen's must try Brinjal Potato with Chilli(地三鲜) dish which consists of brinjal, potato and green capsicum. 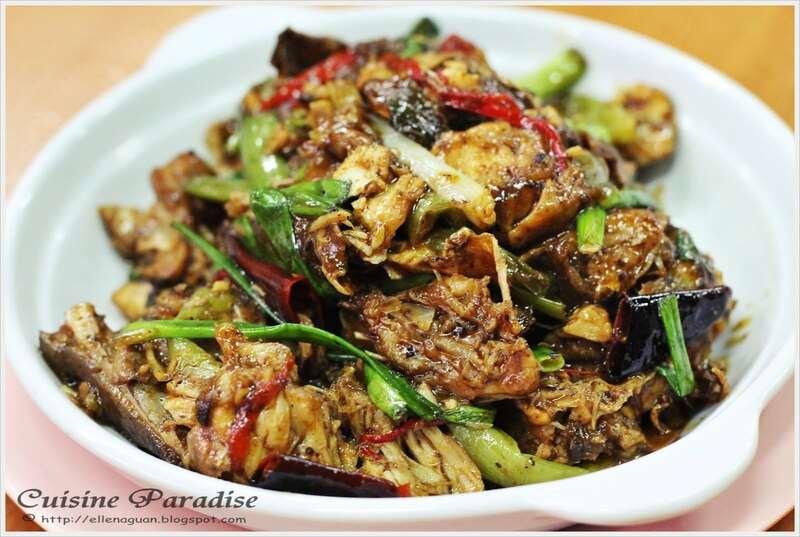 For this dish, the brinjal are cut into long and wide pieces which then coated with batter and fried till golden brown together with potato cubes. These ingredients are then toss in the wok and blend well together with green capsicum and gravy. Although t his might look a bit greasy but it is sure taste great and you won't even notice that "brinjal" in it. Not much of Fermented Beancurd taste on this Deep Fried Fermented Bean with Belly Pork(腐乳炸花肉) dish and the pork meat was rather tough and dry. 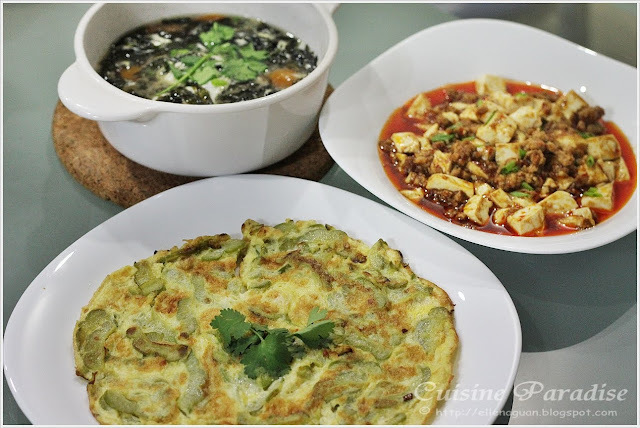 This dish could have be better if the key ingredient "fermented beancurd" taste is stronger or even more tender meat that suits everyone in the family. 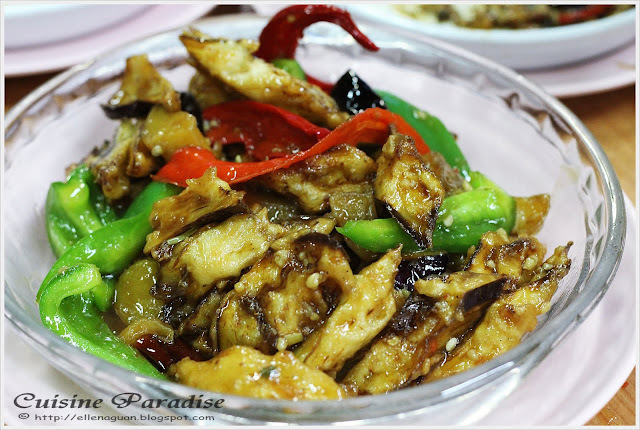 According to Alice who is one of the regular who patronise this Cze Char stall, this White Pepper Crabs(白胡椒螃蟹) is one of her favourite dish when taking orders. 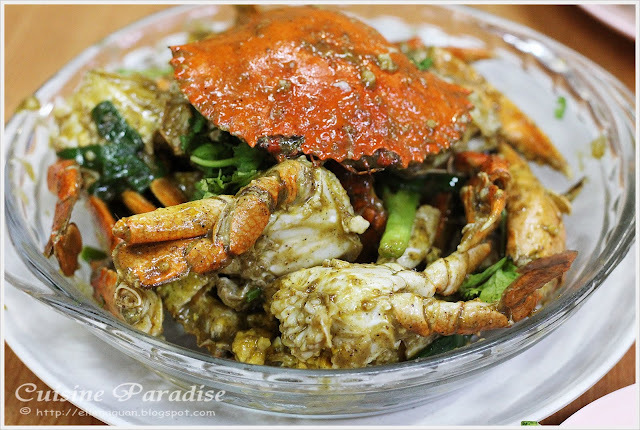 For about S$24.00 you get to enjoy 3 medium size crabs(some still have egg roes) that cook in fragrant white pepper sauce that is a great deal not to be missed. 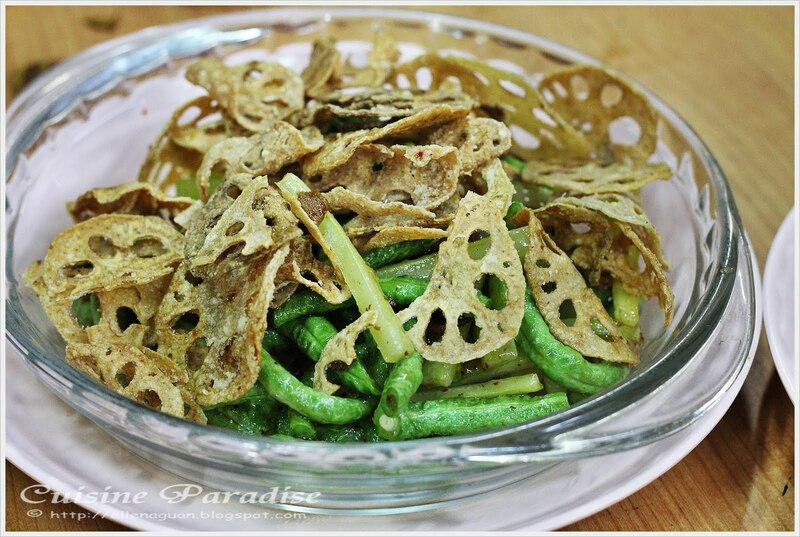 This Snake Bean with Lotus Root(蛇豆炒莲藕) is one of our favourite veggie dish with different layers of "crunchy" texture. They use snake beans (long bean), tossed with celery, salted fish, pork bits, dried shrimps and crispy lotus root chips. Although the lotus chips seems to be a bit over fried but still everyone of us love it's thin and crispy texture. The last was supposed to be the best as we are having high expectation for this Salted Egg Prawn Ball(咸蛋黄炒虾球) which was highly recommended by Makansutra and ieatishoot forum. 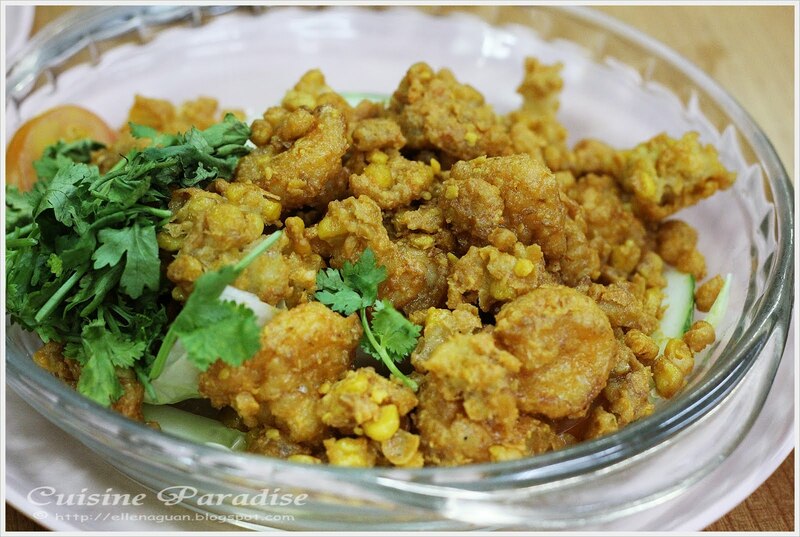 These salted egg yolk prawns with fried battered corn kernels are supposed to be sweet, crunchy and crispy but what we had on that day was rather hard, salty and dried. So most of us were quite disappointed with this dish. 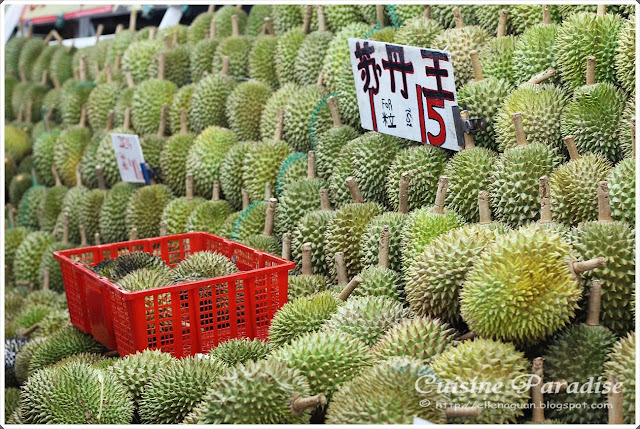 After finishing our 10 Course Dinner at JB Ah Meng, we then proceed to our Durian Feast Session at "Wonderful Fruit Enterprise(旺德福)" which located at 147 Sims Avenue upon recommended by the lady boss at JB Ah Meng. This is the "horrify" scene when you put "18 Durian Lovers” together with their favourite Durian. As you can see everyone is eager to “rip” off the fruit despite of the spiky shell in order to have a seed of these delicious fruit. Honestly we don't really find the Durian is of good grade at this stall, example the "Hong Xia - 红虾"(shown on the bottom right photo above) that we had is totally lousy with sour, tastless and funny combination of taste which cost us more than S$30++ for just 1 durian. 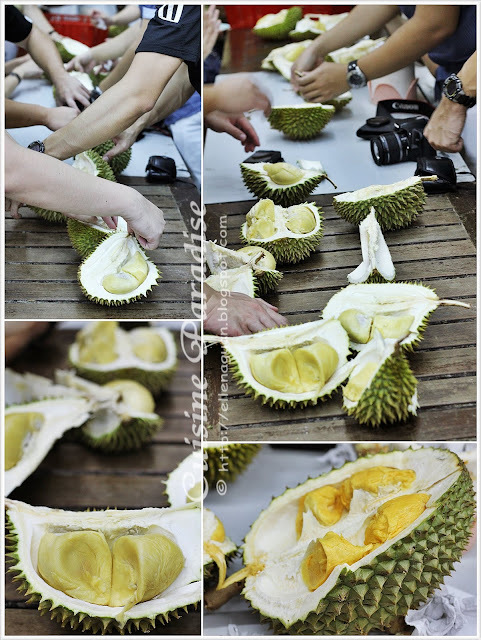 For Durian lovers out there, do you have any good location or stall to enjoy Durian feast? Do share with us your experience. [Easter April $20 Budget Meal] Round-Up! Thanks everyone for supporting the Easter April - $20 Budget Meal event with a Easter theme of using Egg in one of the prepared dish. Thanks everyone whom take the effort to note down the pricing of ingredients and spending on each ingredient to support this event. 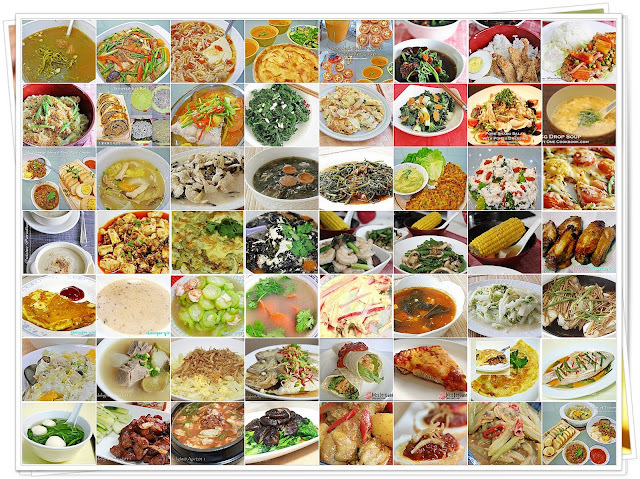 Here we have a total of 21 fabulous sets of "2 Dishes 1 Soup" menu from blogger and facebook friends of different countries such as USA, Australia and Singapore. 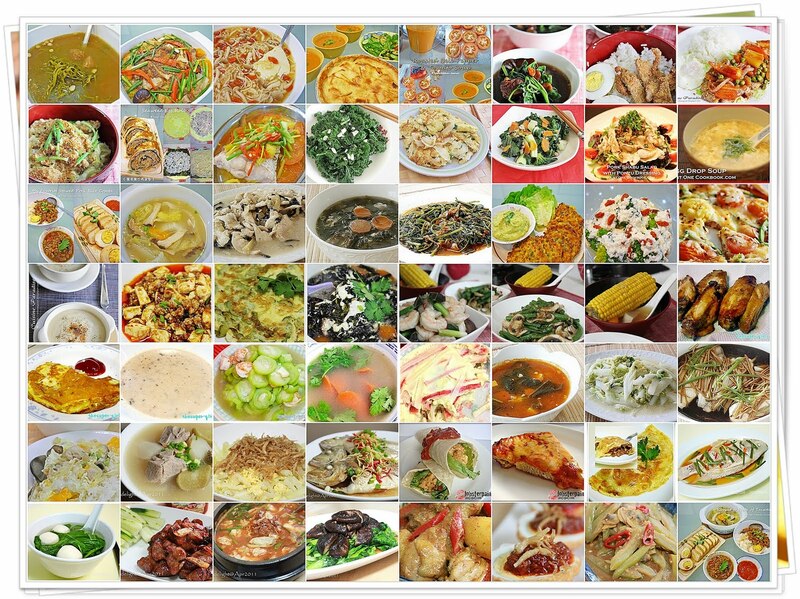 Here are all the entries for the [Easter April - $20 Budget Meal], listed in the order of the date submitted. 1. 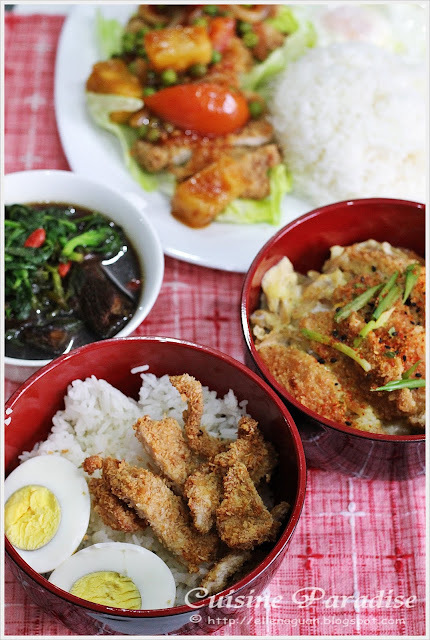 Cooked steamed rice and set aside. 2. Fry the sliced onion till fragrant and add in the chicken pieces. 3. Add in the chicken stock, mirin and soy sauce to taste. 4. Simmer over medium heat for a few minutes. 5. Crack the eggs into a bowl but do not beat the eggs. Instead, use a knife to slightly cut the egg yolk. 6. Once the chicken is cook, pour the egg over. 7. Let the egg cook for about 3 minutes, till the egg yolk is slightly hardened. 9. 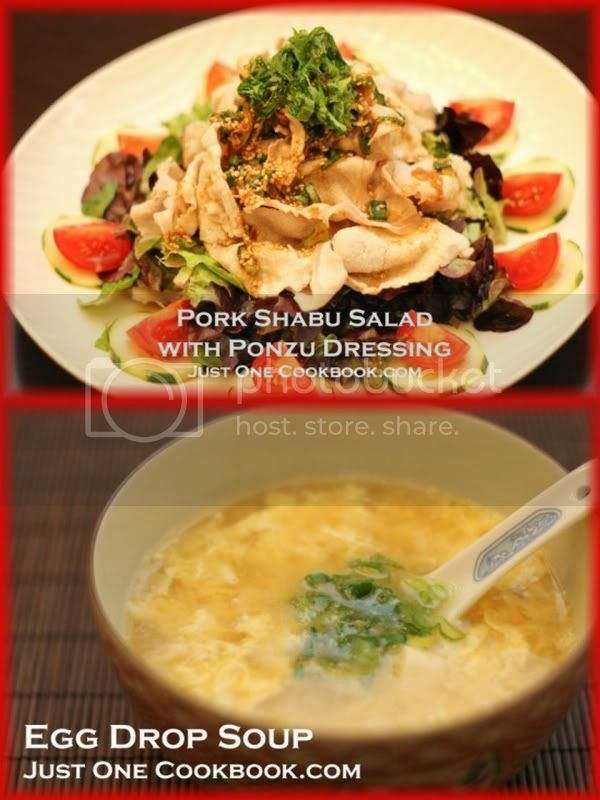 Put the steamed rice into deep serving bowls and serve the simmered chicken and egg on top. 1. Get a packet of instant miso soup paste from the supermarket. 2. Pour hot water and serve. Once again, thanks everyone for taking your time to come out of these wonderful budget meals, ideas and kitchen tips. 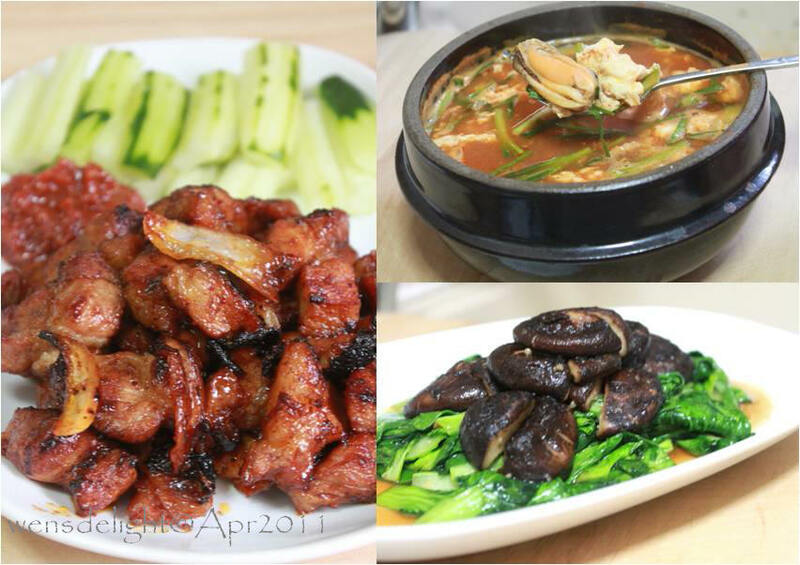 Do stay tune for our May event announcement on the specified "ingredient" upon voting from the readers. 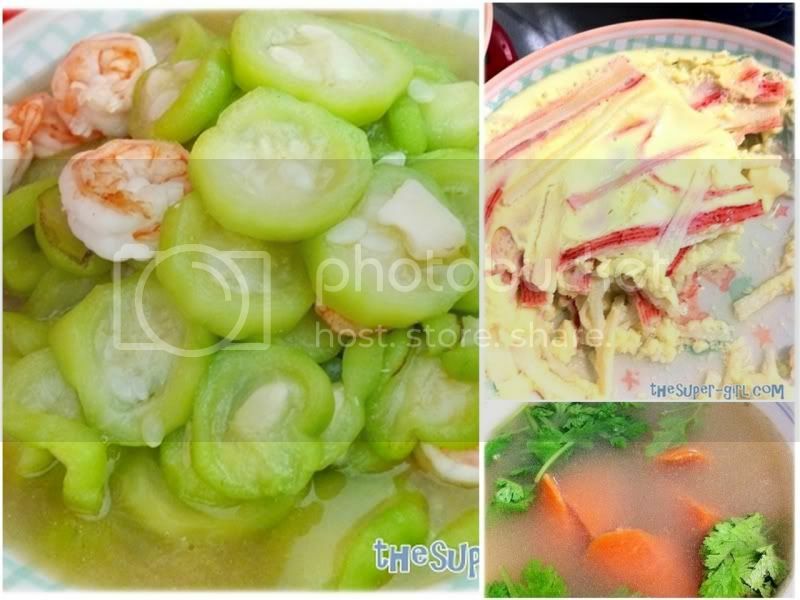 All you dishes are feature at Cuisine Paradise Facebook Page HERE and the dish who earns the most number of "LIKE(s)" will received a mystery gift. Ever since I saw and bought these cute cupcake pop molds, I have always wanted to try making some Cake Pops which is one of the latest trend among online bakers other than cupcakes and macarons. And recently I also saw Starbucks having some cute Cake Pops featuring in their food menu too. What is Cake Pops? Cake Pops can be defined as little/mini cakes on a stick that is coated with chocolate/icing and decorated with all sort of sprinkles or toppings which made famous by Bakerella( read more on the link HERE). 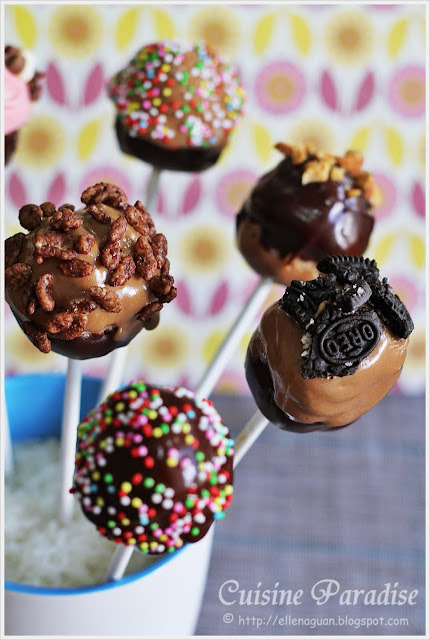 There are a few ways of making these cake pops from either using crashed Oreo or graham biscuits to vanilla or chocolate cake crumbs. 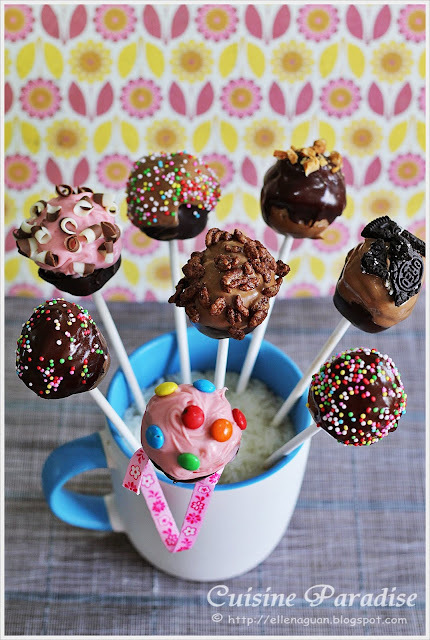 But no matter which method(s) you prefer I am sure both Adults and Kids will enjoy the fun process of rolling, molding and decorating these cute Cake Pops. ~ You can either add more cream cheese or a bit cold milk to bind the crumbs if it is too dry. 1. Break the ready bought marble cake into smaller pieces and place it in a large mixing bowl. 2. Beat the cake pieces at low speed until it resemble find crumbled (refer to the photo above), drizzle Grand Marnier evenly over the cake and beat for another few second till combined. 3. 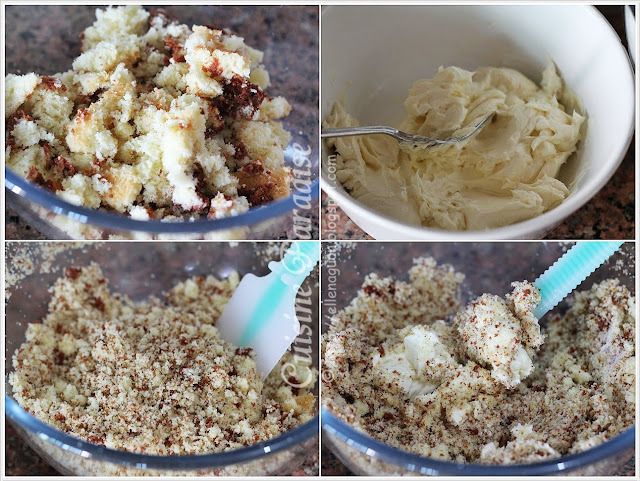 Next using a spatula or hand mix and knead the soft cream cheese mixture with the crumbs till it forms a smooth dough. 4. 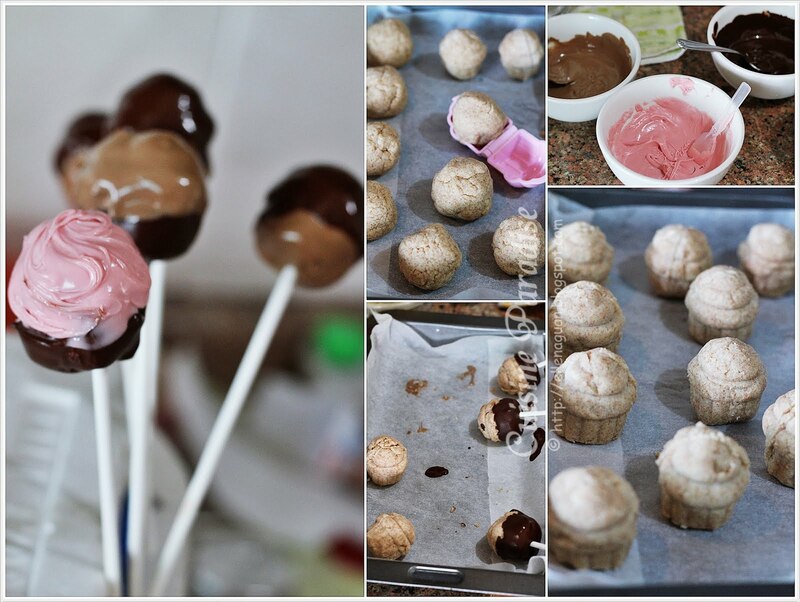 Roll the mixture into a 1” round balls and place on a tray lined with foil/baking paper. 5. When done, place them in the freezer for about 5 minutes before molding them using the cupcake mold. 1. Place one of the chilled dough in the cupcake mold, gently press down to fix the mould and closed it tight to remove any excess dough that are being cut off. 2. You have to work fast and mold all the prepared dough into cupcake shape then freeze them for another 5 minutes to firm it up before dipping with melted chocolate. 3. Melt your choice of chocolate in a microwave safe bowl at 30 seconds intervals on high heat, stirring in between until chocolate melts and become smooth. 5. 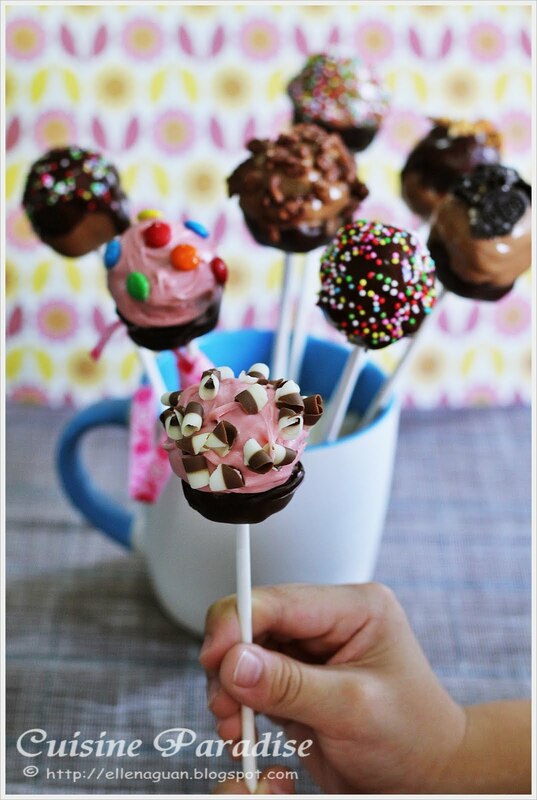 After the chocolate coating, rest the sticks of cake pop on styrofoam block(can get from daiso) or in a tall cup to dry while decorating the pops with sprinkles or toppings. 6. 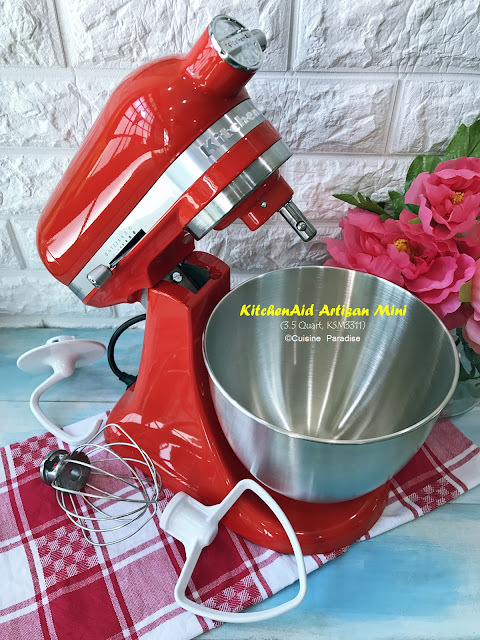 You can refer to the related VIDEO(click HERE) on making these cake pops by using this cupcake mold. Remeber the monthly Aspiring Bakers(founder, small small baker) events that I always participate, for this month of April, the key ingredients will be cheese. Jean suggest that it should be something cheese related on either bakes/frozen desserts. So I will be submitting this to Aspiring Bakers #6: Say Cheese! (April 2011) hosted by Jean from Noms I Must. Secondly I would like to thanks those of you who had participated in the "Gyoza Mold Giveaway" and "Sandwich Sealer plus Heart Shaped Food Picks" events which ended last week. Here is the 3rd “Giveaway” for the month of April to celebrate Cuisine Paradise's 6th Anniversary which falls on 30th April 2011. And I hope with this handy "Cupcake Pop Mold" you can make use of it to shape into different design of Cake Pops where you can refer to their official website HERE. 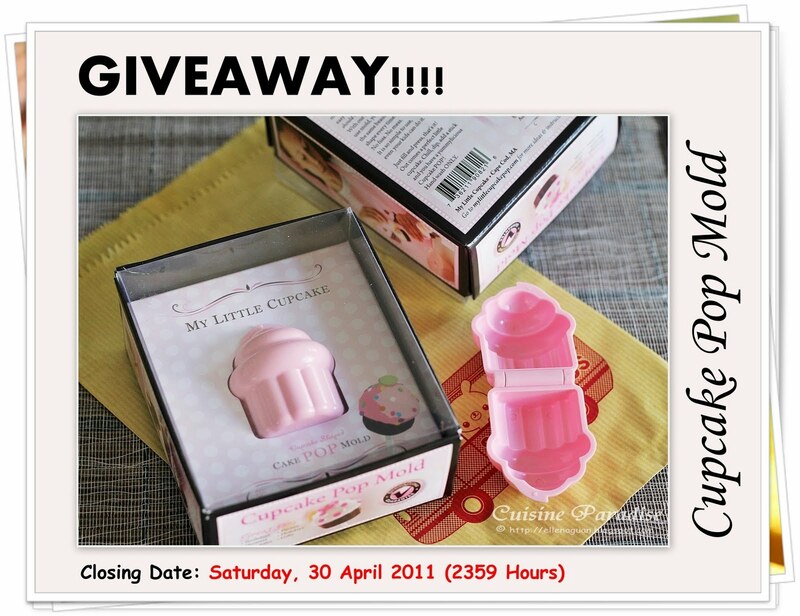 If you are interested to win this set of "Cupcake Pop Mold", just leave your Name and your favourite Cake Pop and topping (strawberries, Oreo, dark chocolate, mint), example "I Love Chocolate Cake Pop With Oreo Toppings" in the comment box and I will pick ONE Lucky winner on Sunday, 01 May 2011. Result will be announce on 02 May 2011. GIVEAWAY RESULTS ARE OUT! 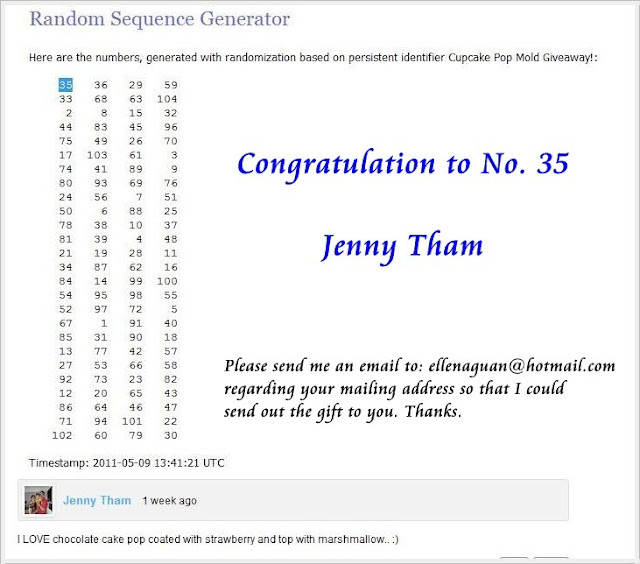 Are you the Lucky One!!!! !